CarGurus has 11,417 nationwide Escalade listings starting at $3,442. Is there any vehicle that better encapsulates American exceptionalism than the Cadillac Escalade? It's a rolling manifesto of opulence, style, and accomplishment. Where other large SUVs are niche vehicles, there is a sense of ubiquity and, simultaneously, a sense of occasion associated with an Escalade. Any ride you take in it is likely to be a memorable one. 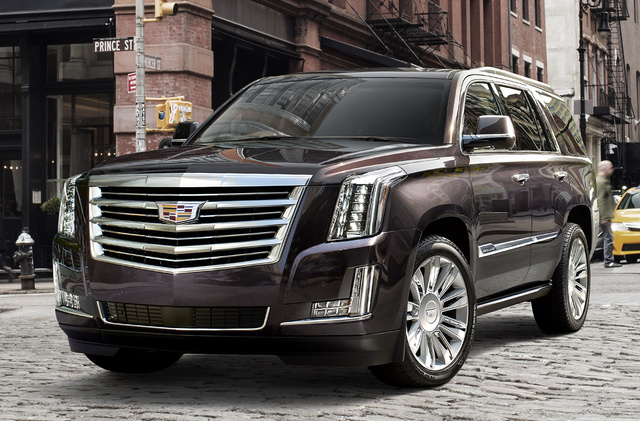 The Escalade is in its fourth generation, which arrived for the 2015 model year and is carried over for 2017. Last year, the SUV received the new corporate crest logo, giving it a more streamlined look. The Escalade rides on the GMT K2XX platform, which is shared with vehicles like the Chevy Silverado, Chevy Tahoe, GMC Sierra, and GMC Yukon. But despite its rugged, gruff DNA, the Escalade competes with the likes of the Mercedes-Benz GL-Class, Land Rover Range Rover, Infiniti QX80, and Lexus LX 570. Adriatic Blue Metallic and Bronze Dune Metallic color choices have been added for 2017, as well as new 22-inch aluminum wheels and some tech updates. Trims have also been restructured into the standard Base, Luxury, Luxury Premium, and Platinum. All trims come with noise-reducing materials, triple-sealed doors, acoustic-laminate glass, and Bose active noise cancellation. Many key elements help define the Escalade's angular, clean, and modern look. The massive grille is flanked by upright LED headlights, with LED cornering lights on up-level trims to illuminate turns. Out back, LED taillights frame the rear corners of the tailgate. The Escalade has an unmistakably upscale interior, with a “vector” look that aims to replicate the downward angle of the lower half of the Cadillac shield. Standard features include keyless entry with push-button start, an power tilt/telescoping steering column with a leather-wrapped multi-function steering wheel, tri-zone climate control, leather seating, and a wireless phone charging pad. The Escalade also comes with standard heated/cooled front seats and standard heated second-row seats. There's also a nifty storage unit in the dash center stack: simply run your finger along the bottom edge behind the climate and audio controls and a power-retracting hatch opens to a cubby with USB port, where you can store an iPod or other music device. The 12.3-inch center touchscreen hosts the Cadillac User Experience (CUE) infotainment system, which features easy-to use menus and large icons and is fully customizable. You simply swipe through presets and drag icons around the screen like you would on your mobile device. CUE also features Apple CarPlay and Android Auto support. Simply plug in your mobile device with the USB port and you can access your smartphone’s music, contacts, maps app, and even receive and compose text messages with voice control. Luxury and Luxury Premium trims come with a standard head-up display, which displays vehicle speed, the radio station, engine revs, speed limits, and turn-by-turn navigation. 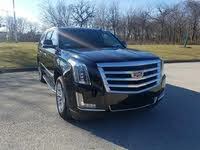 The Escalade is powered by a 6.2-inch cast-aluminum V8 engine. It makes 420 hp and 460 lb-ft of torque, sent through an 8-speed automatic transmission to either rear-wheel drive (RWD) or available full-time 4-wheel drive (4WD). Fuel economy for the 2017 Cadillac Escalade is 15 mpg city/22 highway/17 combined with RWD and 15/20/17 with 4WD. 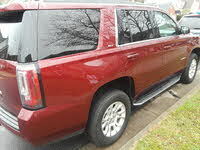 Smoothing out the Escalade's ride is GM’s Magnetic Ride Control. A shock absorber fluid is loaded up with metal shavings and a current is run through the fluid, allowing the system to change the stiffness of the shocks for different driving conditions and respond to changes in the road in record time. For the first time, the 2017 Escalade is available with Automatic Park Assist, which allows it to park itself in both parallel and perpendicular spaces. It's also available with front and rear automatic braking, which can sense if the vehicle is in danger of collision and either alert the driver or automatically apply the brakes. Standard on all trims is Surround Vision, which offers a 360-degree view of what’s around your vehicle, so you can still park with precision when you decide not to let the Escalade park itself. A Driver Awareness package brings in a full suite of safety tech, including lane-departure warning, forward-collision alert with automatic braking, automatic high beams, and the Safety Alert Seat, which vibrates a corner of the driver's seat to alert the driver of possible danger to the corresponding part of the car. Pricing for the 2017 Cadillac Escalade has not yet been announced. Expect it to follow 2016 pricing closely, with a base MSRP of $72,970 and a price of $92,945 for the Platinum. What's your take on the 2017 Cadillac Escalade? Have you driven a 2017 Cadillac Escalade? How do I set the suspension back to touring? it seems to be stuck in sport mode.